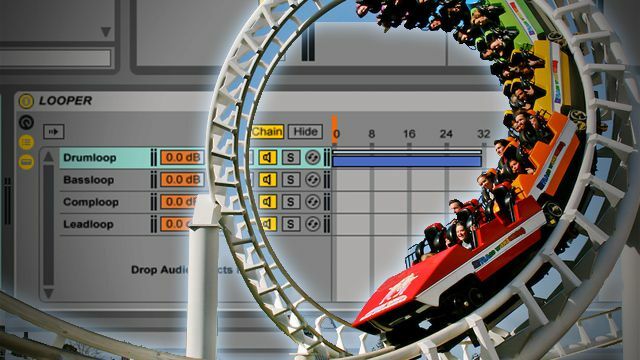 Many live producers and performance artists rely on looping as a way to build a sonic landscape and craft unique shows that vary every time. Beatboxers, finger drummers, and musicians of all types have taken advantage of a loop-based performance. New DJTT contributor Underbelly shares how anyone can use Ableton Live to create a loop workflow that is just as good as any hardware solution. There are two main components in the live looping track – the Instrument Rack that houses our sounds, and the Audio Effect Rack that contains our loopers and gain knobs. This rack is composed of four chains – in this case, drums, bass, comps, and leads. You can set the number of chains to be however many you like, however it is critical that you distribute the MIDI ranges equally so that only one instrument is active at any given time. Do this by dragging out a single chain and right-clicking “Distribute Ranges Equally”. I’ve also assigned a MIDI knob to the orange chain selector on top for easy access between instruments. At first glance this rack looks exactly like the first – the MIDI ranges are distributed in the same way, and the same knob that controls the chain selector in our Instrument Rack also controls the selector in this one. Instead of housing instruments, however, within each of these chains is a Looper and Utility gain knob. This means each instrument in the Instrument Rack has its own dedicated Looper to which it exclusively sends audio: we use the Utility simply to control volume. A footpedal triggers all four Loopers. Because all four Loopers are triggered by the same pedal, it is possible for one Looper to be recording actual audio from the active chain in the Instrument Rack, while the other three are simply recording silence. To remove these silent loops, I’ve assigned the bottom four black keys of my MIDI keyboard to the ‘clear’ button on each of the Loopers. Similarly, each white key to the left of the black keys is assigned to the ‘undo’ button on the Looper for easy recovery from messy overdubs. IMPORTANT DISCLAIMER: my MPD32 uses the ‘red-box’ mapping to trigger clips in session view from the drum pads like an APC. You can download the red-box script in the following link, but without changing the mapping of your MPD using the EDIT mode the MIDI assignments in my template set WILL NOT WORK. Questions? Post them in the comments section below!